Last night a packed Clore studio watched Christopher Hampson rehearse six dancers from Ballet Black ahead of the premiere of Storyville later this month. Named after the now-demolished red-light district of New Orleans, the work follows Nola, an innocent girl whose story has echoes of MacMillan's tragic heroine, Manon. Over the course of an hour Christopher worked with dancers on three scenes from Storyville: honing steps and forcing the dancers to explore the edge of the movement. At one point he joked, "I always know it's better when they're about to fall over". It was impressive to see the choreographer helping the dancers to develop their performances, but also to see him refining his own work. The dancers responded to his feedback skillfully in front of the live audience - something that could have felt awkward was in fact extremely natural. Music for the sections of the ballet rehearsed include arrangements of numbers from Kurt Weill's Threepenny Opera, a piece that Hampson choreographed to while at the Royal Ballet School. On winning a prize for his work, the young choreographer was handed the award by Kenneth MacMillan, who asked him, "Do you know what those songs mean? They're filthy!" The second part of the Royal Opera House Insights evening was a Q&A with Cassa Pancho - founder of Ballet Black - Christopher Hampson, and Ballet Black dancers Cira Roberts and Sarah Kundi. Royal Opera House Education Manager Clare Thurman asked the questions. Cassa Pancho looked back at the 11 years since she founded the company and its challenges and successes over the years. While writing her dissertation on black female British ballet dancers she decided to interview five about their experiences in the ballet world, only to find that there weren't any. Cassa remarked that it was odd to be in a position where your aim is, "not to be necessary, to become obsolete" but that she hoped to get to a point where that was the case. 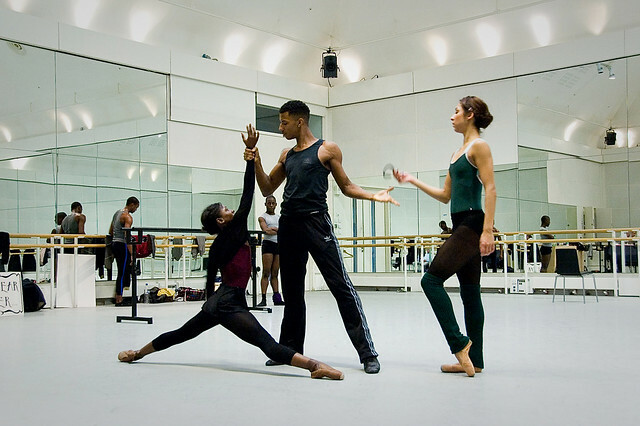 Already it felt like people had realised that Ballet Black commission new work and the coverage they received focused on that, as much as on their ethnicity. Financial pressures were mentioned, but Cassa said that in a small company the difficulty of replacing injured dancers was even more of a worry day today. "We have a very good medical team...and I married a physiotherapist - I planned well ahead." Although both Christopher and Ballet Black were initially known for abstract works, the whole panel spoke of the pleasure of working on a narrative ballet. It was clear that the tale created by Christopher for the company is one they have found inspiring to work on. Cassa summed up the pleasure of working on such a project, saying, "Stories, people love them. Who would have thought it?" The Ballet Bag recently visited Ballet Black in rehearsal, documenting the process with a photo gallery. Storyville is one of Ballet Black's short works coming to the Linbury Studio Theatre on 29 February 2012. Very exciting to see this idea. Wish I could see this when it premieres....Love the idea, the concept, etc. And living quite close to New Orleans makes it even more special to me. Storyville was amazing! I feel very honoured to have had the opportunity to watch Ballet Black performing twice at the Drill Hall in Lincoln. Both performances very different, "Prometheus" and "Storyville" being the main features. On both occasions , I just wanted to watch them all over again. Thank you Ballet Black and your sponsors and keep coming back to the flatlands!